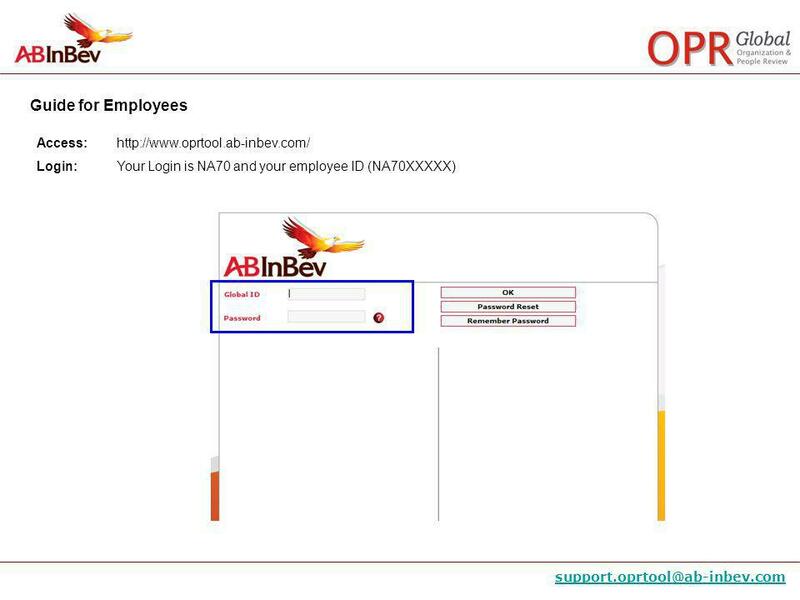 Access: Profile Action: Update personal information such as, position, location, education, mobility, etc. 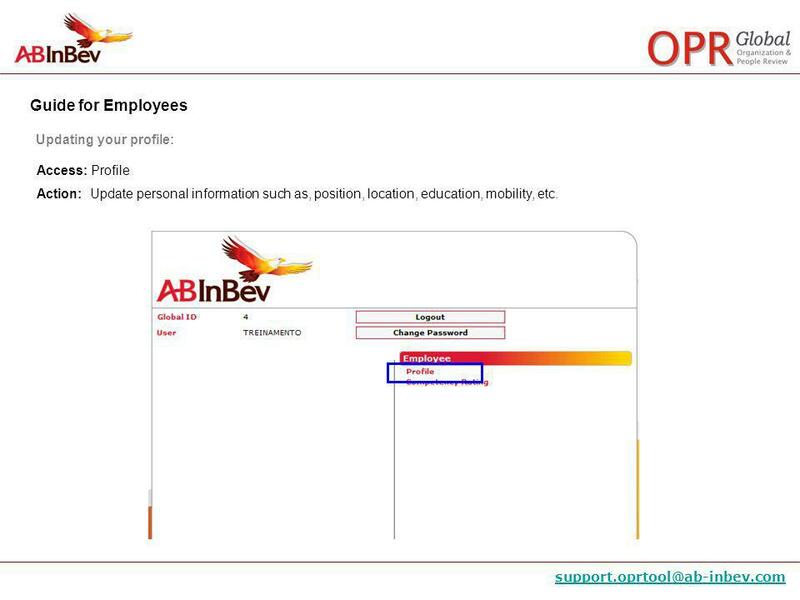 Access: Personal & Organizational Information Action: Check your information – name, date of hire, current location & position. To include/change your picture, click on the “browse” button, attach the picture and click “ok” (nothe picture can be 500kb max). Detail: If any of the information is incorrect, please send an to the contact centre with the correct information WARNING! The picture you upload MUST be saved with the same name as your login (i.e. NA70xxxxx.jpg) WARNING! You must hit the SAVE button at the bottom right of each page or you will lose any changes you have made! 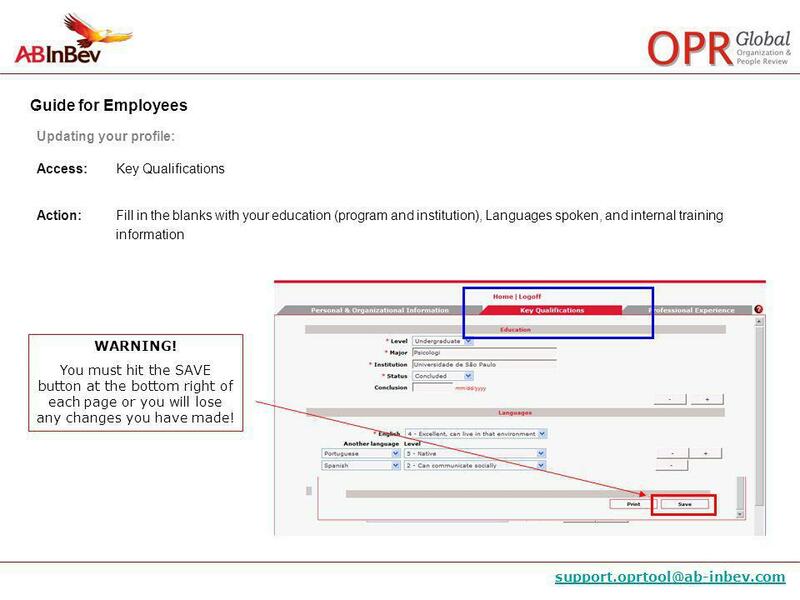 Access: Key Qualifications Action: Fill in the blanks with your education (program and institution), Languages spoken, and internal training information WARNING! You must hit the SAVE button at the bottom right of each page or you will lose any changes you have made! Access: Professional Experience Action: Update information about key positions, mobility, strengths, career interests, achievements, etc. 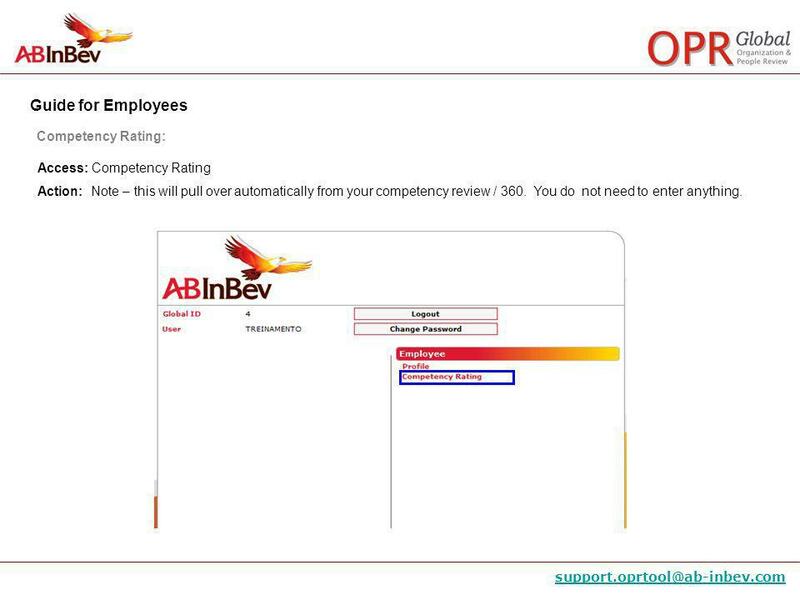 Review and confirm the performance rating information. 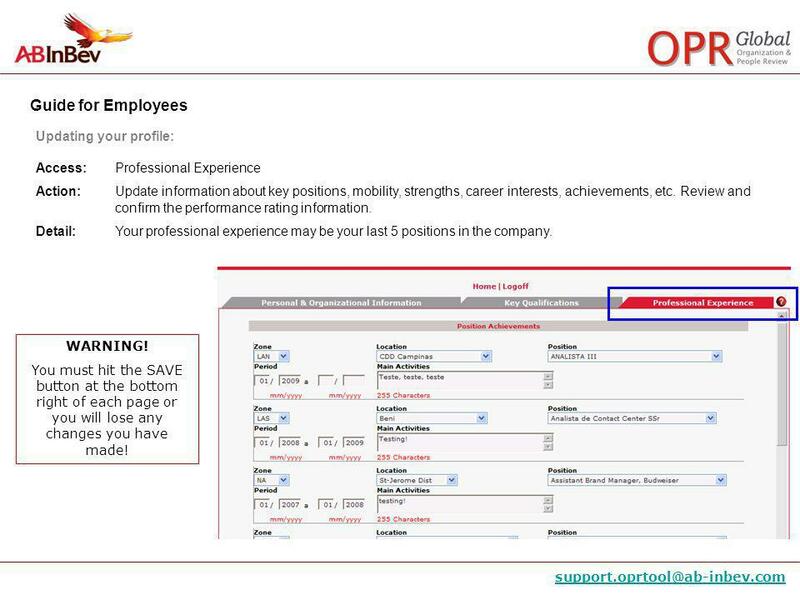 Detail:	Your professional experience may be your last 5 positions in the company. WARNING! You must hit the SAVE button at the bottom right of each page or you will lose any changes you have made! 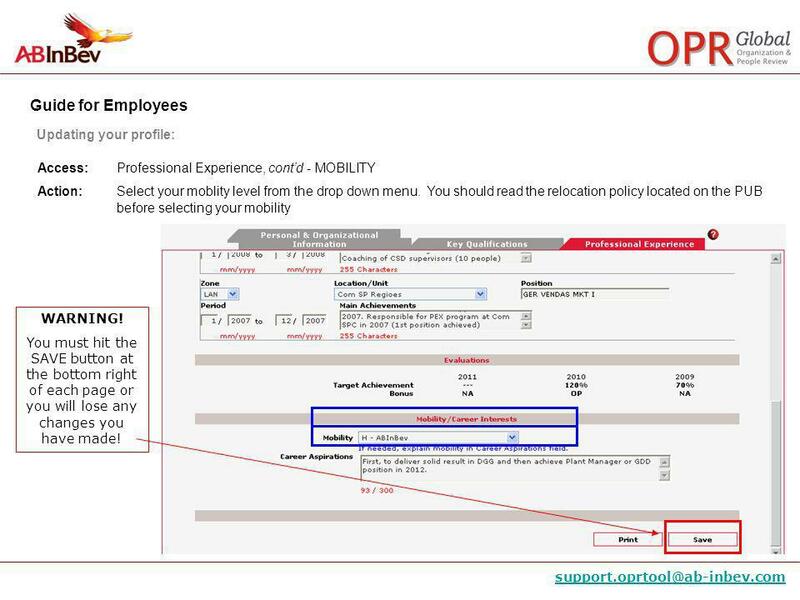 Access: Professional Experience, cont’d - MOBILITY Action: Select your moblity level from the drop down menu. You should read the relocation policy located on the PUB before selecting your mobility WARNING! You must hit the SAVE button at the bottom right of each page or you will lose any changes you have made! 11 Competency Rating: Access: Competency Rating Action: Note – this will pull over automatically from your competency review / You do not need to enter anything. 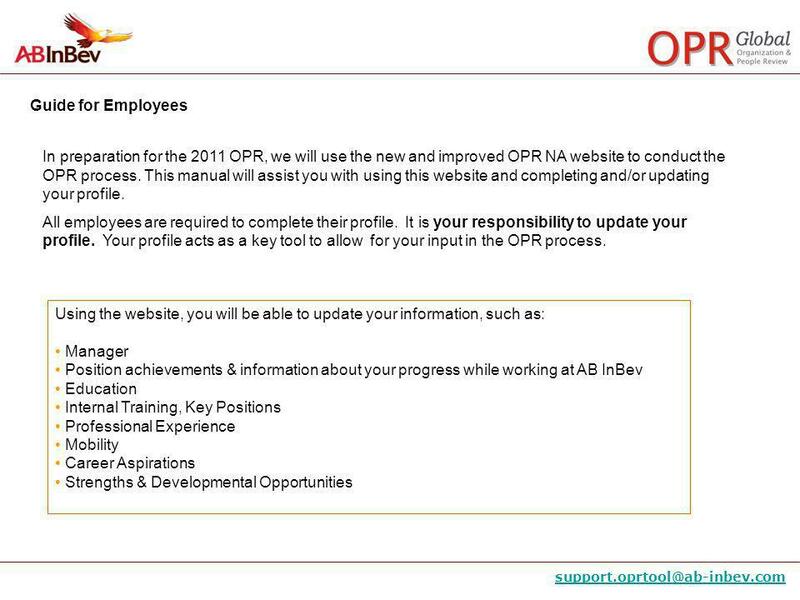 12 You have now completed your profile for the OPR meetings!! 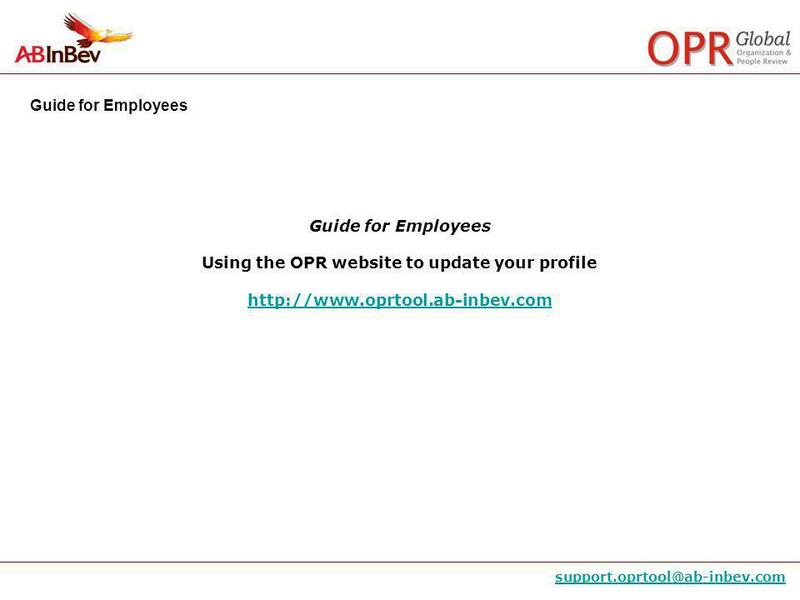 Download ppt "Using the OPR website to update your profile"
Online Application Tutorial We’re Hiring.. Register for a new account and take the first step towards and exciting career in the Public Service! Your. 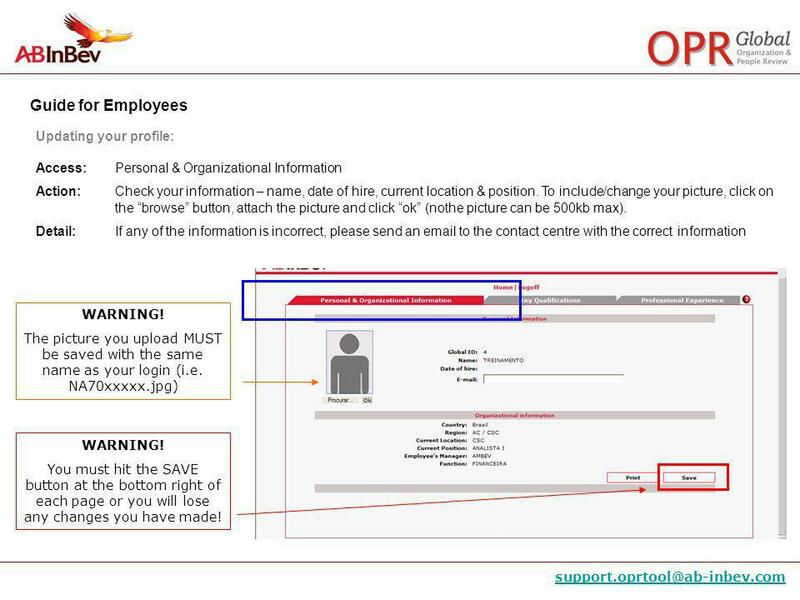 Profile CV How to complete your CV section. You Home Page Where is my CV page? Your profile CV section can be found by clicking on the icon next to the. Go to the following website to view Defense Production jobs: ytFeGk wNU53ckU9 Click the. Spouse Tuition Assistance Program Spouse Briefing STAP Development Team. The purpose of this guide is to help People Managers: 1. 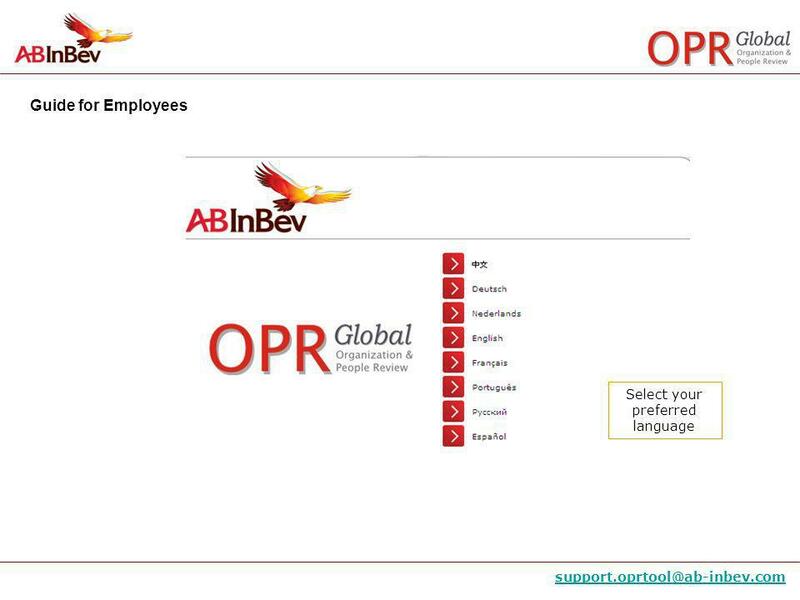 Change an existing OPR meeting 2. 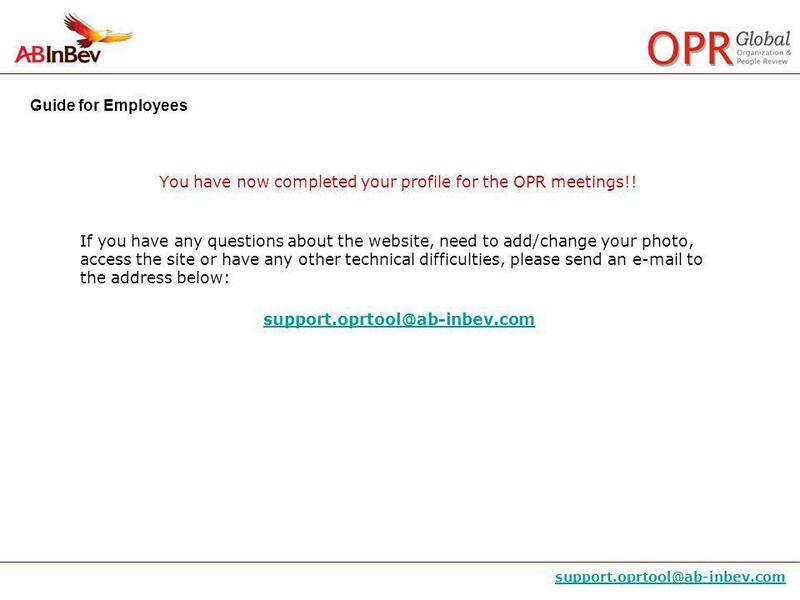 Delete an existing OPR meeting.